A particularly volatile weather setup is shaping up for today across northern Italy and the northern Adriatic region. An outbreak of severe thunderstorms is expected as discussed in the Severe Weather Outlook for today. 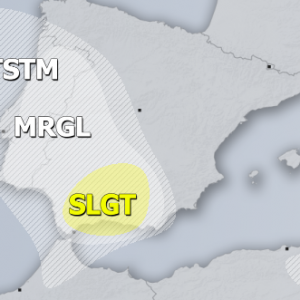 A strong negatively tilted trough is moving across the CNTRL Mediterranean today. It is rounded by a very strong 60-70 kt mid level (500 mbar) jetstream. The left exit of the jet passes over north Italy and the northern Adriatic during the day. A strongly unstable airmass is present, current data (6:20 UTC) indicates temperatures of 24-26 °C and dew points 19-24 °C in central and eastern Po plain, Veneto and Friuli. With a strenghtening low-level jet over the N Mediterranean, expect MLCAPE values to locally exceed 2000 J/kg with much higher SBCAPE. See more detailed discussion in the Severe Weather Outlook for today. MLCAPE map, GFS model guidance. Map: Wetterzentrale. A surface low is expected to form over N Italy, increasing the LL winds over the northern Adriatic region, providing enhanced shear in 40-60 kt range, for widespread organized severe thunderstorms. While there is currently significant differences between latest model guidances by different models, they are in general agreement for several isolated storms forming prefrontally on the plains and likely training cells on the southern Alpine flank. This will result in excessive amounts of rainfall along ther slopes, locally 100-200mm is well possible. Later, A large MCS is expected to form along the frontal line in the late afternoon / evening with significant wind damage and flash floods threat moving east into NW Balkan. Excessive rainfall amounts across Alpine region, GFS model guidance. Map: Modellzentrale. Within the HIGH risk region, placed across N Adriatic into W Slovenia and NW Croatia, the high-end severe threat exist due to a possible formation of a significant wind event. Some high-resolution models are hinting the evolution of a large cold pool associated with the forming evening MCS over N Adriatic before being pushed into N Balkan. Closer look on the maps reveals a real-inflow jet being developed behind the leading bow-echo squall-line. This would lead into a significant wind damage with extremely severe winds possible. Notice the sharp turn of the winds behind the line with much lower temperature / humidity. Further north-northeast across central Europe and towards Poland, rather widespread severe thunderstorms are expected within the moderate to strongly unstable airmass and moderate sheared environment. 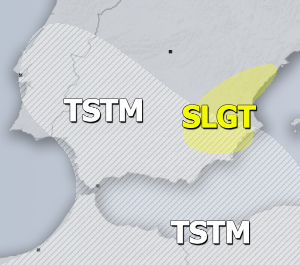 Main threat with these storms will be large hail and severe winds, while some higher tornado threat is expected across Slovakia and Poland where enhanced helicity is present near the northwards advecting warm front.